Except within its chronic wasting disease surveillance areas, the Michigan Department of Natural Resources has agreed to issue supplemental deer feeding permits in the southern part of the Upper Peninsula. The action comes with average U.P. snow depths measured across the region nearly double that of a 15-year average for late February and March. Feeding deer large quantities of food to supplement natural winter food resources – termed “supplemental feeding” – is allowed by permit in the northern U.P. counties beginning in January each year. This type of feeding differs from “recreational feeding,” which is limited daily to 2 gallons of feed, placed within sight of a home or camp. Recreational feeding is allowed year-round across the U.P. In southern U.P. counties – which typically exhibit milder winter weather conditions – free permits are issued for supplemental feeding dependent on weather conditions. Minzey said when conditions suggest the potential exists for significant winter deer mortality, regulated supplemental feeding is authorized by the DNR. This winter, the early part of the winter was fairly moderate, but conditions deteriorated in February. Therefore, supplemental feeding permits are being issued in the southern U.P., except within chronic wasting disease core and expanded surveillance zones set up last October, after a doe tested positive for the disease in Dickinson County’s Waucedah Township. As of March 4, there have been 56 days this winter with greater than a foot of snow accumulated on the ground in the U.P. More snow is forecast for the region this weekend as temperatures warm, with the potential for rain and snow next week. Weather forecasters are predicting the snow pack to last on the ground into April, with temperatures trending in long-term forecasts to remain below average. Stewart said peak winter mortality typically happens from late March through early May, and the factor most often attributed to high winter deer mortality is the length of the season. Stewart said it is important to remember the deer herd in the U.P. can suffer losses naturally with extreme winter conditions. Difficult winters have negatively impacted herd numbers previously – notably during the mid-1990s – and are expected to impact herd numbers in the future. 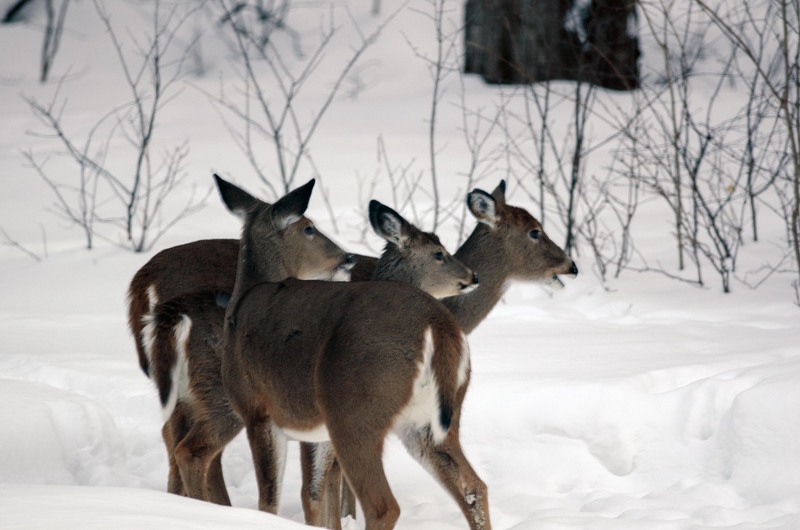 A lack of available high-quality deer wintering habitat remains a factor limiting the deer herd in the U.P. Supplemental deer feeding permits are available by contacting DNR offices located in Baraga, Marquette, Crystal Falls, Escanaba, Newberry, Sault Ste. Marie and Shingleton (Cusino). For more information on chronic wasting disease in Michigan, visit Michigan.gov/CWD. Find out more about white-tailed deer and deer hunting at Michigan.gov/Deer. Deer: Three deer braving the 2018-2019 winter in the Upper Peninsula. 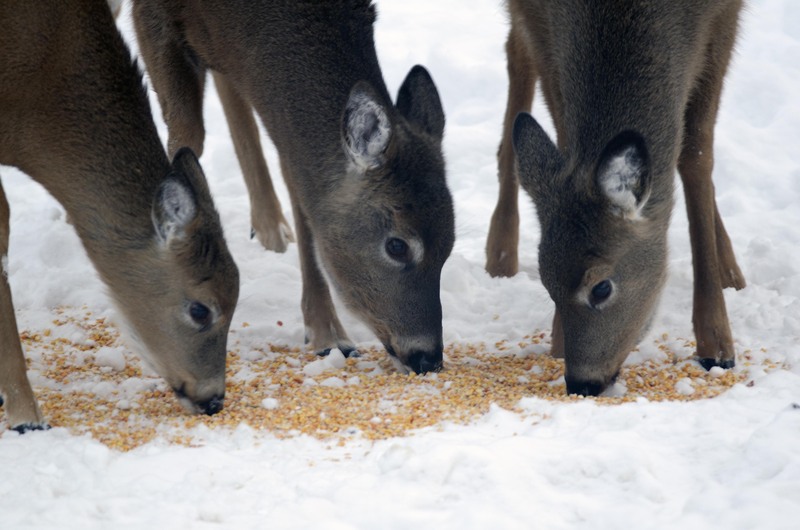 Feeding: White-tailed deer feeding on corn provided by a homeowner in Marquette County. 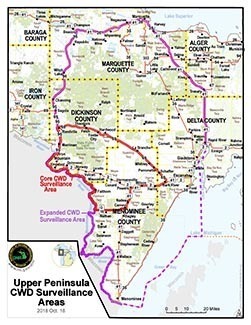 Map: A map showing the extent of the DNR’s core and expanded chronic wasting disease surveillance areas in the central Upper Peninsula.